Home / Articles / 2012 / 2012 Manufacturing Trends Survey: Can Production This Year Top 2011? Processors can't get a break from uncertain markets, rising costs and changing safety standards, but they continue to grow and keep optimism high. Despite lingering overall economic uncertainty, food & beverage processors apparently have come off a pretty good year. 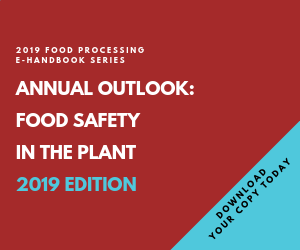 Those with plant operations responsibility remain cautiously optimistic for their prospects for profits and growth for the new year, according to Food Processing's 2012 Manufacturing Trends Survey. Download all of the responses from the 2012 Manufacturing Trends Survey by clicking this link. No registration is required. That optimism is tempered by what may turn out to be a structural shift as consolidation and outsourcing give rise to greater uncoupling of brand owners and the plants that produce their products. Capital expenditures, automation, energy and sustainability issues continue to make gains, albeit with mixed messages as to the rate of growth. Still, the overall picture for 2012 is healthy, given the challenges processors face and factors beyond the industry's control – such as rising commodity costs, government regulations and worldwide financial uncertainty in this increasingly global business. The big question may be: Can we beat 2011? Our first question on the survey, "What are your manufacturing priorities for 2012?" (Figure 1) saw not a single change in the order from last year – but some tiny movements up and down within the 10 priorities. Food safety, of course, remains Job One; cost control remained about even with last year's votes; sourcing & materials garnered a few more first-place votes and a gain in its average score; labor concerns nearly doubled its first-place votes; environmental concerns rose, too. 45 percent say their companies are growing. 23 percent expect plant expansion. Less than 6 percent expect a decrease in production. 63 percent say they're optimistic going into the new year – that's less than the 66 percent of optimists in both 2010 and 2011, but way above the 44 percent of in 2009. Processors volunteered write-in statements, as well. There were multiple comments that placed maintenance high on the priority list, in large part because the discipline serves to maximize asset health and lifecycle costs, thereby conserving or delaying capital expenditures. Others cited cost and budgetary constraints; capacity management and utilization; managing staff as plants close or are consolidated; and maintaining product quality. By the way, the survey was taken between Nov. 14 and Dec. 20, 2011. We had 205 responses, and all should have been food & beverage processors with plant operations responsibilities. When asked, "How is your company dealing with the economy?" 45 percent said "We're growing," indicating sustained optimism, just a point over last year's response. Since the financial meltdown, perhaps driven by optimism or confidence in long-term planning, there's been a steady uptick in the number of respondents have said they expect to make "no great changes," from 32 percent to 36 percent to 40 percent over the past three years. In our survey, one-tenth of respondents cited "other" ways of dealing with the economy. These included efficiency improvements, cost and waste reductions, price increases and generally "minding every output" in the face of rising commodity costs. Some noted the difficulty of finding qualified employees, while another seemed to answer those comments by saying: "We are growing with process design and moving toward mechanical automation to increase production." On the negative side, expectations of staff reductions are up to 18 percent of respondents vs. last year's 13 percent, which itself represented a drastic reduction from the prior year's 34 percent. The other side of that coin: 28 percent expect an increase in hiring, better than last year's 26 percent. Now, much like the proverbial "other shoe dropping," comes outsourcing. Last year, 3.6 percent said they would outsource within the U.S. and Canada and another 3.6 percent outside of those boundaries. Today, 6.5 percent of respondents plan to outsource to manufacturers in the U.S. and Canada and 5.5 percent will outsource further afield. While staff reductions and more outsourcing could put employees on the streets, it also may be a net neutral for the industry – but with the same workers and plants operating as low-cost contract manufacturers and packers for the brand-owners, who have retrenched to focus on their core competency, marketing. This view is perhaps bolstered by a 6-point decline in those expecting their companies to expand (23 percent). Nevertheless, 72 percent of respondents' anticipate that their plants will see a production increase in 2012, up roughly 3 percentage points from a year ago. Asked specifically about staffing levels for 2012, 28 percent think their companies or plants will increase the size of the workforce -- up 2 points from last year -- while 18 percent plan to reduce the workforce compared to only 13 percent who expected layoffs or attrition last year. Shifting from the size of the workforce to its compensation, survey-takers remain conservative in their expectations, but have been rewarded for meeting the challenges of the times. In 2009, 35 percent of respondents expected salaries to rise at their plants, and subsequent research showed that salaries rose instead for 45 percent. When asked about 2011, 40 percent expected their facility to increase salaries, and once again, they underestimated: 48 percent of plants increased salaries, according to this year's respondents. 41 percent of this year's group expects a raise in 2012. Automation, which roughly 30 percent of respondents cited as one of their three top priorities through the past few years of economic uncertainty, may be more important than the numbers indicate. It serves as a tool to support other high-priority issues, such as labor reductions (and labor consistency and quality), cost-containment, process efficiency, quality control and regulatory compliance. One respondent replied, when asked how his company is dealing with the economy, "We're going full blast with automation." These figures may be contradictory, but 17 percent report "all or most of the plant" is automated – last year's number was only 5 percent. But only 8 percent say the "entire production line" is – versus 15 percent last year. Automation in production sections saw a healthy 9 percentage point increase, to 54 percent, while packaging sections dropped insignificantly to 37 percent. Food safety is the top priority of most food processors every year. Asked about their level of concern about E. coli, salmonella, listeria or other pathogens for the coming year, 21 percent said they are "more concerned--I think more incidents are coming," compared to 18 percent last year. Those who are "less concerned" and feel "things are under control" are up just a point, to 17 percent. These changes have come at the expense of the perennial, majority "same level of concern--these worries never go away," which declined 5 points to 61 percent. Asked if they implemented new food safety measures in the past year, 70 percent answered in the affirmative. That's' not a big drop, but it is 5 percentage points below last year's response for year 2010. Not unexpectedly, then, the number of respondents who did not increase food safety measures has gone up annually, too: 23 percent in this year's survey did not do more last year, and 16 percent don't expect any more programs this year. Perhaps this is understandable in light of the fact that many programs are ongoing and not technically "new." Likewise, looking forward to the coming year, 68 percent say they will implement new measures, again, lower than last year's 73 percent. Asked to cite specific practices their facilities implemented in 2011 or will implement in 2012, employee training was by far the most-cited at 74 percent, followed by third-party certifications (49 percent), HACCP planning (47 percent), and several other practices involving improvements in sanitary design and equipment, pest control, microbial detection systems and the use of outside consulting services. One interesting development is that this year (for activity during 2011) third-party certifications overtook HACCP plans for second place. Paradoxically, certifications under the various schemes of the Global Food Safety Initiative are down. Last year 51 percent of respondents were pursuing compliance under the Safe Quality Food Initiative; only 40 percent report doing so coming into 2012. Similar drops were recorded in GFSI programs from the British Retail Consortium and FSSC 22000. Only International Food Standard and Dutch HACCP were up. Perhaps most GFSI initial efforts were concluded last year -- or maybe we diluted the answers a little by this year adding AIB certification (being pursued by 17 percent). Part and parcel of the need to meet government and market safety mandates is the need for food tracking and tracing programs, which 78 percent of respondents currently have in place today. Underlying all forms of plant improvements, from food safety to machinery and automation/information systems, is the need for funding. As reported in our own 2011 Capital Spending Outlook, capital expenditures were expected to enjoy a very healthy recovery for the second year following "a dismal 2009, in which a 15 percent drop in expenditures reflected the global economic crisis." The Manufacturing Survey results indicate 47 percent of responding companies are increasing budgets this year, and 16 percent of them by more than 10 percent. The biggest answers, however, were "about the same" or "I don't know." Only 8.2 percent of respondents expect a cut. Asked if the economy led to capital projects being deferred from 2011, 32 percent of respondents said their plants did delay some work -- a pleasant surprise from last year's survey, when 45 percent said 2010 projects got the red light. Energy management projects gained proverbial steam in this year's survey, likely for the simultaneous benefits of environmental sustainability and the reality that they offer a measurable payback. While energy management is "not a burning issue right now" for 24 percent of survey-takers, that number represents a three point drop from last year's survey. 61 percent say they are "taking steps in energy conservation," up four points from last year. A wide variety of initiatives are being pursued, led by energy audits (34 percent) and followed by recycling/redirecting energy (18 percent), negotiating with energy providers (17 percent) and seeking alternate energy sources (16 percent). Asked how their plants' "green" initiatives are faring "given the state of the economy," 36 percent, or roughly the same proportion of respondents, said such projects are becoming more important than they were in the previous year. An interesting difference between last year's survey and this one is that 19 percent say green projects are either becoming less important or are not important to them, up from 14 percent a year ago. Overall, the industry remains optimistic, but with reservations caused by market and regulatory uncertainties which threaten that optimism. In open-ended comments, numerous processors suggested a need to shed additional light on, for example, the uncertainty and practical implementation of standards and regulations. Some survey-takers mentioned environmental issues, while more cited food safety-related issues. One respondent sees a need for more detail on FSMA rules, including costs of compliance and third-party audit requirements. He also called for more cost-benefit data on GFSI compliance as allocations in audit time have "significantly increased." Another said he'd like more research on regulatory concerns, taxes, fees, labor costs, pesticides and international differences. One would like to see more and better reporting by all processors to the FDA, but at the same time, reduced costs, and a separation of the agency's food and drug functions. Others called for more investigation of broad cost-containment issues across the board, while others cited "people" issues. Like the processor who said: "We have a lot of experienced employees retiring and have concerns about a reduction in the knowledge/experience level of those employees filling in the openings." And another, who noted that processors need to make their employees trust their primary issue, because "fear is the black hole the machinery falls into." That's in line with the age-old need to combat the "FUD" factor of fear, uncertainty and doubt. Which is exactly what the industry is struggling to keep at bay as it enters another tough but hopeful year of growth. Food Processing welcomes additional input, whether on the record or anonymous, which may help fuel additional editorial coverage in the magazine for 2012. Send comments to dfusaro@putman.net. How Does 2014 Look for Food and Beverage Manufacturing? Food Processing is asking your help for our 13th Annual Manufacturing Trends Survey. Food Processing is collecting responses for its 2015 Manufacturing Trends Survey.